Mmmm, where did they find this then? That’s typical. You wait over four decades for a new car to appear in the TZ series, and all of a sudden you get two different ones two years in a row. Admittedly the fact that Zagato was working on a road-going variation of the TZ3 it unveiled last year at the Villa d’Este concours was not a very well kept secret. The company itself acknowledged as much at the end of 2010, when the Christmas card it sent its followers acted as a teaser showing an enigmatic new entry alongside the TZ1, TZ2 and TZ3. Some labelled it a TZ4, but officially it goes by the name of TZ3 Stradale, not so much in reference to the beautiful Alfa 33 Stradale (which was not penned by Zagato), but to clearly separate it from last year’s TZ3 Corsa. In fact the two cars are part of a single programme of Zagato’s Atelier, the arm of the design firm that specialises in coachbuilding one-offs for discerning – and well-heeled – enthusiasts. 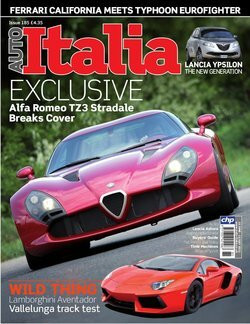 Zagato spokesman and marketing director Paolo di Taranto insists that the cars are “two chapters of the same story.” He goes on to explain: “The Corsa was very well received, as both a full-out track-oriented car on race-bredmechanicals, not omologated for the road, and with a neo-classic design theme. It was a direct link to our racing background and to our joint history with Alfa Romeo. It was thus handbuilt in aluminium with Plexiglas windows. By contrast, the stradale is avant-garde, it represents a more futuristic vision of the TZ design theme, more fresh and up to date. It has glass windows, a full carbonfibre body and is road legal, using the chassis and drive-train of the Dodge [Chrysler] Viper ACR.” Certainly at first glance there is much to unite the two cars visually, but under the skin they are rather different animals. While the TZ3 Corsa (or race version)was based on a competition Gillet Vertigo chassis with a 4.2-litre Maserati V8 engine, the Stradale (street version) is built on the underpinnings of a Dodge Viper ACR, complete with the American snake’s 8.4-litre V10 powerhouse! A clever pitch by Zagato, one must admit. While the Gillet chassis was remote from any Alfa Romeo connection, it had at least some real race cred while the Ferrari-derived V8 was much the same that found its way under the bonnet of Alfa’s own 8C – itself assembled by Maserati in Modena. The Viper ACR, on the other hand, comes from Dodge, and with Fiat set to own over 50% of Chrysler Group by July, the possibility of Alfa Romeo sharing engines and platforms with Dodge is a reality (whether one likes it or not). The ACR is now out of production but is still a relatively accessible car: buying one new cost $110,000 in ACR-X form. Three customers have already taken one to Zagato for conversion into a TZ3. The cost of the conversion itself is undisclosed, especially as it can vary significantly depending on the degree of personalisation requested by each customer. For instance, car number 2 is headed to Japan and will feature a full aluminium fascia on the dashboard and seat cloth selected in collaboration with a leading Milan fashion house. The total output will be limited to only nine Stradales, and most are already spoken for. What one gets for his money is a simply stunning coupe, closely inspired by the TZ1 and TZ2 but now with decidedly modern construction and detailing, courtesy of Zagato’s Chief Designer Nori Harada. The windscreen wraps around the A pillar to meet flush with the side windows, a clever trick that was devised in the heyday of aerodynamic research, but which is used by designers chiefly to conceal the visual disruption of the pillar. As the windows then wrap over and above the volume of the TZ3’s tail, the glass surfaces form an uninterrupted ribbon all around the cabin. Mr Harada points out: “With a truncated tail concept, the more continuity you can express on the main volume before you cut the shape off, the more dramatic the effect. 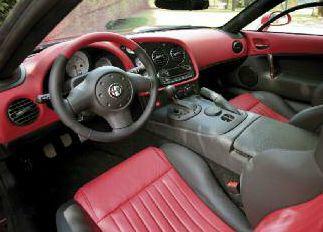 “I cannot pretend that this makes the TZ3 Stradale truly modern. It probably isn’t an appropriate term when the basic shape of the car is based on a 50-yearold design. 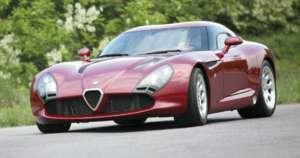 But Zagato now needs to refrain from doing too much retro styling. The TZ3 Corsa that you saw last year was actually designed many years ago. At the turn of the millennium the name of Zagato was somehow buried in history, it wasn’t really recognised as a modern day reality. So we had to concentrate on re-establishing our name, and my approach was simple. It was a matter of linking with our heritage to let people know we were still active, and to trigger new interest. 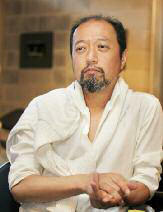 Now, after years of effort, levels of expectations from our designs has risen. 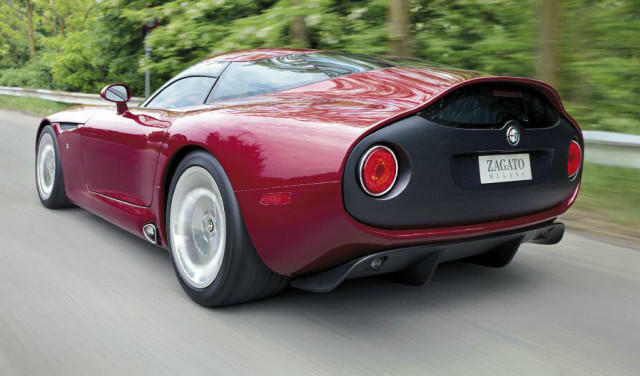 “I don’t think Zagato enthusiasts expect us to depart radically from our heritage. 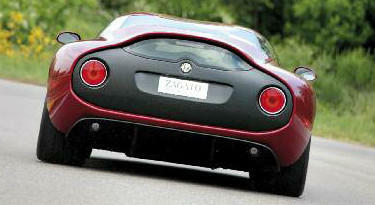 Fundamentally, from Zagato people expect something sporty. Because our aesthetic language is deeply rooted in motor racing, we must tend towards the purest automotive shape. I am still trying to design something that comes down to being just a pure, beautiful shape. I do not want to continue styling cars that might appear simply as retro, so with the TZ3 Stradale I vied to bring a more contemporary interpretation of the TZ line.” Zagato’s famous ‘double-bubble’ roof is a trademark of the company’s styling codes, but it actually appears here for the first time on any TZ. The front end graphics have been revised, with headlights housed in a carbonfibre fairing cut by a gaping mouth much like the TZ2’s headlamps were originally shaped around air intakes. Performance-wise, the TZ3 Corsa claimed a 435bhp output to match an 850kg kerb weight, with a racing carbonfibre chassis tub. The Stradale is based on a steel frame and relies on 600bhp (which could reach 640bhp with an ACR-X drive-train), tipping the scales at some 1530kg (3360lbs), hence the resulting driving experience promises to be entirely different. The external dimensions of the two cars are very comparable, on the other hand. Surprisingly, the TZ3 isn’t particularly daunting to drive on normal roads. Well, no more daunting than the Viper ACR it is based on anyway. The gargantuan V10 gurgles raucously on start-up but runs very smoothly and its massive torque allows the car to toddle very happily in traffic, without giving out excessive noisenor signs of overheating. Placed high on the tall and wide centre console but right under the palm joyfully close to the steering wheel, the short-action gearlever is a delight. The brakes are extremely responsive, and overall the impression is of a pleasantly docile machine that one could realistically expect to drive around without too much strain. To unleash its cavalry on a racetrack or on the proverbial autobahn must be a truly exhilarating experience, but alas one that Zagato’s execs would – quite understandably – not let us contemplate. 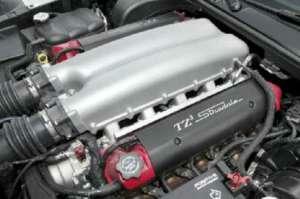 The original TZs were never more than 2-litre cars. Never mind that the 2010 TZ3 Corsa’s 4.2-litre V8 already marked a departure from tradition in that respect, this latest incarnation is a wild beast that doubles that figure! In doing so, it shows Zagato adopting a completely different route to the one indicated by Alfa Romeo earlier this year with the nimble, mid-engined 4C concept. The two cars are almost diametrically opposed, in fact. But what is truly amazing is that both are somehow equally acceptable as Alfa Romeos, demonstrating just how much potential the brand still holds and how far its image can be stretched. Fiat have already acknowledged Zagato’s return to form by launching a version of the 500 developed with the Milanese coachbuilder at the Geneva show this year. 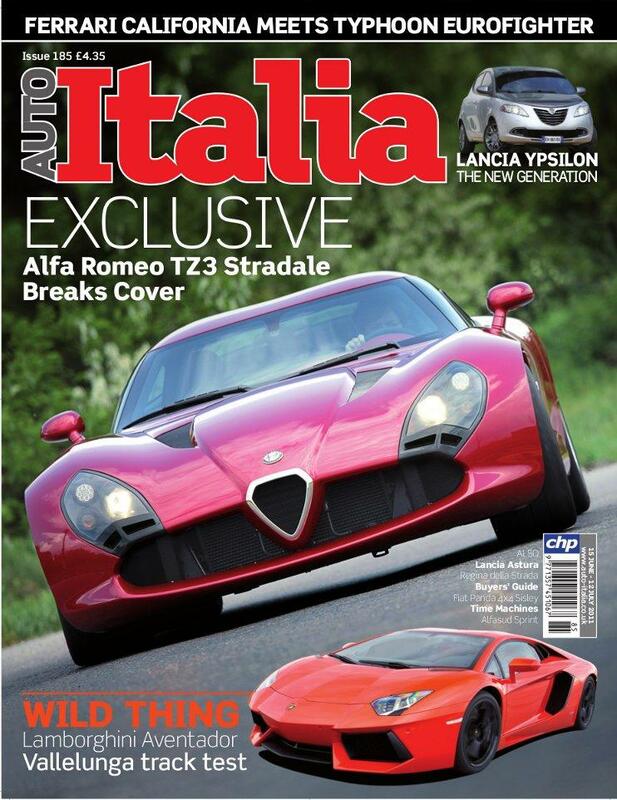 Wouldn’t it be nice if they decided they could apply some of that ‘Z’ Factor to models in Alfa’s current model range? In some ways, the sensations behind the wheel of the TZ3 Stradale are not unlike those triggered by driving around in Zagato’s SZ coupe of the early 1990s. Like its idiosyncratic forebear, the TZ3 enchants and puzzles at the same time. It will divide opinion among die-hard enthusiasts of the marque, but for its poise and presence alone it should be considered a worthy addition to the TZ series. Let’s just hope it doesn’t take another 45 years before the next one comes along.